Blogger has recently released a feature that lets you publicly subscribe to other blogs. Google calls this "following" and you can only follow blogs powered by Blogger, at least for now. "Do you have a favorite blog and want to let the author and readers know that you are a fan? Well now you can do that and more with the Blogger Following feature," explains the help center. Bloggers can add a widget that lists the people who follow a blog. 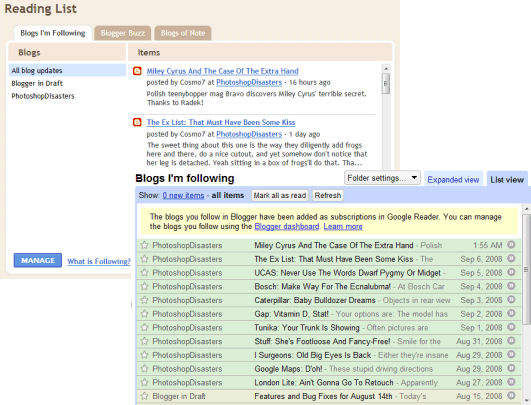 Visitors can follow a blog from the widget and see their subscriptions in Blogger's dashboard or in Google Reader. In most feed readers, subscribing to a feed is an anonymous action and the only public information is the total number of subscribers. The new Blogger feature indirectly adds public subscriptions to Google Reader. "The Followers gadget lets you surf the network of people who read and interact with blogs. Just click on any of the followers and you'll go to their profile. For now, that profile is just their Blogger profile page with the blogs they own... but down the road, we'll also be integrated with Friend Connect. Which will open up this network further, in a couple of ways: A non-Blogger site can add a Friend Connect gadget to show the people following it; and you can filter the followers of a blog to show only the friends you already have on your favorite social network. Which you can view as extending your social network out into the blogosphere, or as the blogosphere incorporating all social networks -- take your pick. Of course all of this is based on OpenSocial, so anyone will be able to add gadgets and talk the OpenSocial protocol to access, with user permission, all of this network data and do new and interesting things on top of it. This represents a natural evolution of the loosely joined, standards-based pieces that have always characterized blogging." http://www.blogger.com/follow-blog.g?blogID=<BLOGID> (e.g: follow Google OS). that can be hidden in the settings. Instead of building a social network like MyBlogLog, Google creates an application on top of other social networks. Incidentally, the application is first tested for blogger.com, but a future Google Reader API and the migration to OpenSocial/FriendConnect will make it look more interesting. Just beware of problems with the integration with Reader. By the way, you can follow non-Blogger blogs too. On your Blogger dashboard, there's an "Add" button to add followed blogs that lets you enter blogs by their site URL or feed URL (you can also import blogs from your Reader subscriptions). Note that this button only shows up once the following feature is officially rolled out to your account, not if you force it by following a blog with the URL you gave. One thing I continue to be mystified by is how they social networking enhancements are made to other Google products while Orkut, the company's fairly early entry into that product space continues to be relatively unchanged. Have they lost the source code to Orkut or something? The only time I see Orkut in the news is when the products namesake has had a big party in his penthouse or been seen in public with his "sponsor" Marissa Mayer. It's beginning to look like Google has a bad case of nepotism on its hands. Wouldn't it be much easier for people to "opt in" to social networking by establishing an Orkut account (which would enable all of these new features for the other products) or otherwise "opt out"? Instead I have to constantly check to see what new things about me might have been published by my having a Blogger, Picasa, Gmail, or other Google provided service. I could be wrong, but this is starting to look like bad design of large proportions. Note, I'm posting this with my "Google Account", which seems to represent a moving target with respect to how much I am divulging in the process. One thing i miss after removing mybloglog is i cannot post this widget anywhere else. I think it will follow once google release some API for that. Many thanks for your write up on this new feature. I'll be sure to reference this useful information you have gathered when I write about it on Blogger Buster. Add the "Followers" page element. The interface is pretty crude. I wish GOOG would take the time to polish what it already does before going in yet another direction. I am agree with Journeyist. 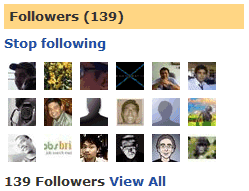 isn't there any ways so that we,classic template users,can have our blog followers ? it's nice if you could help us with this. and,please inform me if you have the 'how to put followers for classic template' article. Tonight, in many greek blogger blogs a number of followers was dissappeared ! As for mew I had 68 followers, now it shows 57. Anyone knows what happenned ?? Four followers from my blog have disappeared too. What's the problem? I used to use this feature until they ruined it by making the formatting of the widget look like a 1st grader threw it together. Does anyone know how to get rid of the white border? The border setting in the config doesn't seem to work. I just started a blog and have some people who have clicked the Follow button, including myself just to test it, but it doesn't email anyone once I've posted something new. Any ideas on what I need to do to get my blog to email people that I have posted a new blog? Please email me at susankasher@gmail.com. Thank you. There is only one problem. How can I block a follower now? i like this new feature, and i hope that with it more people will follow my blog. you can use feedburner to get people to subscribe to your blog. i lost all my followers while changing my template tonight , how can I fix this? CLASSIC TEMPLATERS NEED THIS TOO!!!!!! My account info says I have 12 followers, but they are not shown. Strange, they used to be. Does anyone have any idea how to fix this? how do i insert this widget if im using my own blog template? I can't see my followers either. Anybody had any chance to work it out? I can't add followers application to my blog. I can add all the others but not this one. why? I really likes blogger new application features. This one surely be a good. Will check it soon. Google already have introduce great social applications indeed. They should make it simple to get rid of what you don't want. I want to get rid of anything to do with followers, but no one can help me. I had to delete three blogs several months ago because of the followers. I cannot even find out who is messing up my blog. How do you like them potatoes? Who let's them. Could it be a virus or malware? I do not want anything to do with any follower of my blogs and I want to keep them out. Anyone out there that can help? I do not want them. How can I notify Google or Blogger direct? im just wondering, where i can get the follower widget for my blog?? my blog platform is wordpress..
To anyone who lost subscribers to their blogs, maybe they chose to unsubscribe? Other than that, I have no idea what happened. What are Facebook Followers? What are they and what info can they see about me?? Thanks in advance...! !